� Aluminum - A light metal that causes dementia and Alzheimer's disease. You should never inject yourself with aluminum. � Antibiotics - Chemicals that promote superbugs, which are deadly antibiotic-resistant strains of bacteria that are killing tens of thousands of Americans every year. � Formaldehyde - A "pickling" chemical used to preserve cadavers. It's highly toxic to the nervous system, causing blindness, brain damage and seizures. The U.S. Department of Health and Human Services openly admits that formaldehyde causes cancer. You can see this yourself on the National Toxicology Program website, featuring its 12th Report on Carcinogens. � Monosodium Glutamate (MSG) - A neurotoxic chemical called an "excitotoxin." It causes brain neurons to be overexcited to the point of death. MSG is toxic even when consumed in foods, where it causes migraine headaches and endocrine system damage. You should NEVER inject MSG into your body. But that's what health workers do when they inject you with vaccines. � Thimerosal - A methyl mercury compound that causes severe, permanent nervous system damage. Mercury is highly toxic to the brain. You should never touch, swallow or inject mercury at any dose. There is no safe dose of mercury! Doctors and vaccine pushers LIE to you and say there is no mercury in vaccines. Even the CDC readily admits vaccine still contain mercury (thimerosal). 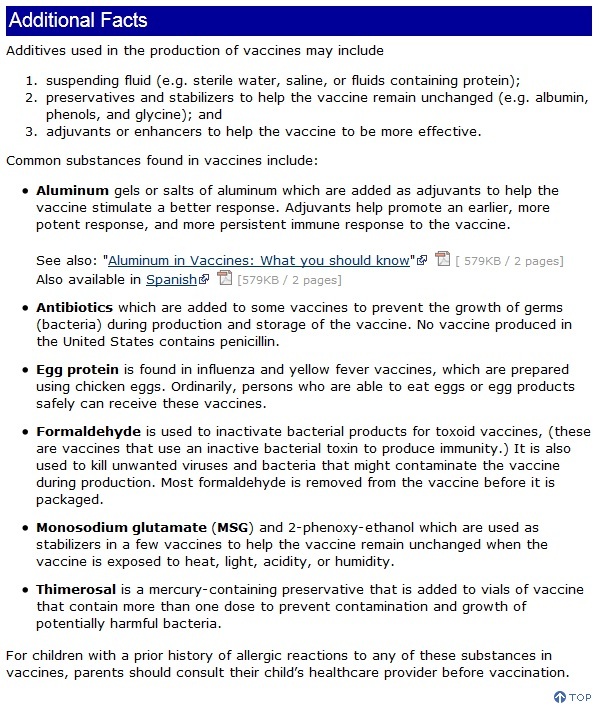 � Vaccinations "...may produce small but measurable increases in blood levels of mercury." � "Thimerosal was found to cross the blood-brain and placenta barriers." � "...similar toxicological profiles between ethylmercury and methylmercury raise the possibility that neurotoxicity may also occur at low doses of thimerosal." � "... there are no existing guidelines for safe exposure to ethylmercury, the metabolite of thimerosal." � "...the assessment determined that the use of thimerosal as a preservative in vaccines might result in the intake of mercury during the first six months of life that exceeded recommended guidelines from the Environmental Protection Agency (EPA)..."
� ..."In the U.S., thimerosal is still present as preservative in some vaccines given to young children, as well as certain biological products recommended during pregnancy. Thimerosal remains a preservative in some vaccines administered to adolescents and adults. In addition, thimerosal continues to be used internationally as a vaccine preservative."